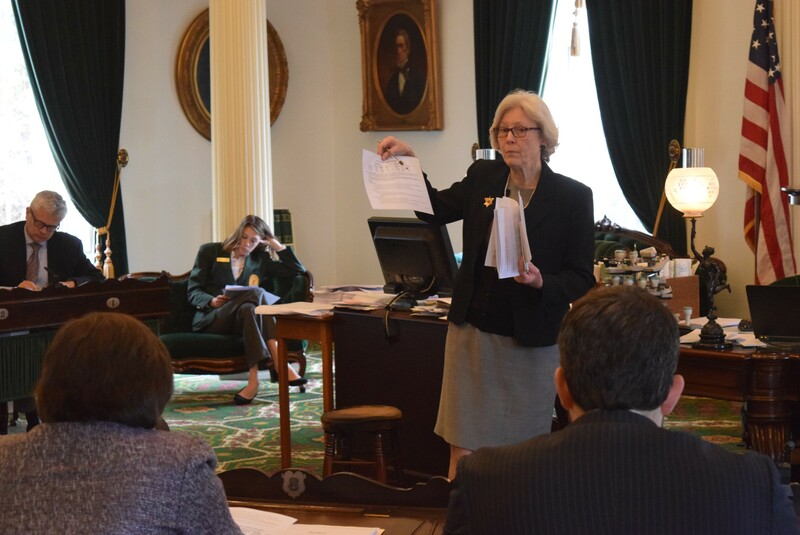 Senate Appropriations Committee chair Jane Kitchel explains the budget proposal to fellow senators Wednesday. With a 30-0 vote, the Vermont Senate unanimously stood behind its $5.8 billion budget proposal Wednesday, setting the stage for possible legislative adjournment by the end of next week. “It’s amazing, isn’t it?” said Senate Appropriations Committee chair Jane Kitchel (D-Caledonia) of her first-ever unanimously passed budget bill. The Senate’s budget includes a few key differences from the version the House passed last month, meaning the two chambers will have to hash it out. Those negotiations are expected to start Friday, clearing the way for the session to adjourn a bit early. The conference committee will pit Kitchel against her sister, House Appropriations Committee chair Kitty Toll (D-Danville), who is in her first year in that role. Toll’s proposed House budget passed in March by a 143-1 vote. As her committee started delving into the details of the Senate’s budget Wednesday afternoon, Toll said that the unanimous support her sister’s budget won surprised her. “I am just floored,” she said. Among the chief differences in the Senate’s proposal is a shift of $7.9 million in teachers’ retirement expenses from the general fund to the education fund. The move is meant to allow the Senate to fund other general fund priorities. “That’s the major difference,” Toll said of the two chambers’ budgets. Count Gov. Phil Scott among those also wary of the move. He argued that the shift can’t be made unless other programs paid for from the education fund are cut to make up for it. “We have to backfill it some way,” he said. Kitchel stood by the proposed shift, saying that teachers’ retirement costs are a legitimate education expense because they are driven by local school district decisions. The assumption that it will result in an increase in property taxes is “tenuous,” Kitchel said. Anticipated increases in sales tax from Amazon online purchases and savings in teacher health insurance costs could help offset the $7.9 million, she said. Providing $9.8 million to mental health agencies to boost salaries in hopes of mitigating a shortage of crisis help. The House had proposed adding $3.1 million. “We have crisis beds but only at a 65 percent occupancy because they can’t afford to staff them,” Kitchel said. Repurposing the state prison in Windsor as a re-entry facility for inmates. The plan is projected to save $2.5 million because it would take less space and less security than the full prison. Gov. Phil Scott proposed closing the prison entirely, which he said would save $3.5 million, while the House had called for keeping it open as a prison. Increasing childcare subsidies by $3 million, with $2 million of it set aside for the lowest-income families and infant and toddler care. The House had proposed no increase in childcare funding. The governor proposed $9.3 million, which was based on a plan to level fund all school budgets, which lawmakers rejected. Providing $4 million to the Vermont State Colleges. Scott had proposed the same amount while the House proposed $2 million. Directing the state to seek bids by June to shift Vermont Life magazine from a state-operated publication to a private one. Kitchel said the magazine has accumulated a $3 million deficit over the years. * “It raises a fundamental question: Should we be in the publishing business?” Kitchel said. Directing the state to come up with proposals by December to reorganize Vermont's EB-5 regional center. The immigration investment program came under fire after last year’s Northeast Kingdom scandal. *Correction, April 27, 2017: A previous version of this story miscalculated the magazine’s total deficit. Taxing Question: Why Are Lawmakers Saying 'No'?